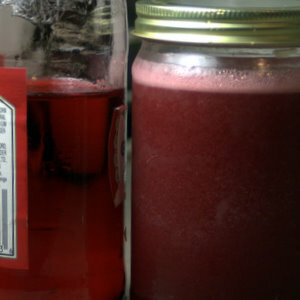 It took a long time for me to warm up to grenadine as a cocktail ingredient, after a childhood chock full of bright red Rose’s Grenadine Shirley Temples. But now I know how many great cocktails include grenadine. A couple of personal favorites are the El Presidente and the Blinker. And now that I know how easy it is to make my own grenadine, I’ll never go back to Rose’s. Like many a first time grenadine maker, I started with Paul Clarke’s epic Grenadine Face-off. The first time I make cold process grenadine, I shook and shook and shook…and finally gave up and used the blender. The results were fine. Now I use my handy dandy milk frother, and it’s even faster, cleaner, and easier. Put juice and sugar in a conveniently sized resealable container. Take your milk frother and incorporate the sugar. Add vodka to extend life. Refrigerate. Will keep a good long time. Where Rose’s doesn’t taste much like anything but sugar to me, the homemade has the the taste of the pomegranate juice and a much richer, deep color to boot. The best grenadine I’ve had to date was an experiment by Zane Harris (newly of Rob Roy), based on a recipe he’d uncovered that called for both pomegranate and raspberry. His process was long and complicated and someday I may try it, but for now, I’ll stick with a recipe that I can whip up even faster than simple syrup (because I don’t have to wait for it to cool). I used my latest batch to try out a recipe in Ted Haigh’s newly reissued Vintage Spirits and Forgotten Cocktails, the Have a Heart. I dropped the lime juice to 1/2 ounce, adding a lime wedge garnish lets the drinker decide to tart it up. Stir while thinking weepy 1934 thoughts, strain into cocktail glass, garnish with lime wedge. As in the picture above, the cocktail on the left uses Rose’s, on the right, homemade. 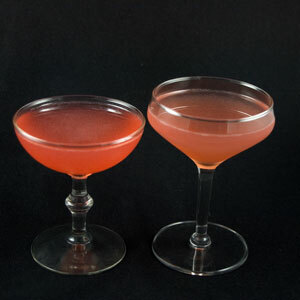 The fake color of the Rose’s carries through to the cocktail, while the homemade contributes to a drink with a much deeper, appealing, adult color. Even more important is the taste. I didn’t care for this cocktail with the Rose’s. With the homemade grenadine, however, this is a tasty, well rounded drink. I must admit, I also love using my homemade grenadine in homemade Shirley Temples. Fill a rocks glass with ice, some soda water, and spoon in up to a tablespoon of grenadine, and I have a light, refreshing drink that’s just sweet enough. And it’s a great base to experiment with bitters! I especially recommend a dash or four of blueberry bitters! What’s your favorite way to use grenadine? I think a Jack Rose is my current favorite grenadine drink. What I may suggest is that you try some pomegranate molasses as a base as you make your grenadine. The problem with the already-made juice is that it’s been pre-manipulated, with sugar/citrus added. Finding the pomegranate molasses is generally no problem. So, if you take that, add two parts water, one part sugar and the juice of two lemons (to the base 10oz Pomegranate molasses bottle) for preservative and taste – you have a delicious grenadine. That said, you’ll balance the ingredients to your taste, so those numbers are just for a start. BUT! This recipe WILL NOT look like store-purchased grenadine. It’ll be dirty-red and cloudy even if you filter it. BUT! It’ll taste outstanding. Sylan — A Jack Rose is indeed a fine cocktail. Andrew — thanks for the recommendation to use pomegranate molasses. I will certainly give it a try! I love grenadine. It’s so hard to beat the Jack Rose for a grenadine cocktail, but I find that I use it more often in El Presidente cocktails (a rum cocktail? I know, you’re shocked). Thanks, Matt. Another great excuse to make grenadine is that I “rediscover” the El Presidente every time I make a new batch. Such a wonderful cocktail. Nice post and the cocktail looks good too. A tip- try to add a handful of dried hibiscus flowers sometimes, its makes a nice grenadine. Does this work with cold process grenadine? Great post, Stevi! I am hoping to try your recipe tonight, assuming I can find some pomegranate juice. Quick question, though: would it be okay to keep homemade grenadine in a plastic bottle? I’d like to keep it in something that would be easy to pour, and I don’t have any glassware that fits the bill. If you have the chance to reply, I would appreciate it. Have a good one! Plastic bottle should be fine. I keep syrups in them all the time, and in fact have used them previously for grenadine. It’s just that all of mine were in use when I made this latest batch! I usually see pomegranate juice in the grocery store along with all the other “everything but orange” juice selection.